Passive solar does not generate actual electricity from the sun, but is simply an architectural discipline involving harnessing the sun for warming in winter and cooling in summer. Only solar panels – or PV – generate electricity, using the PhotoVoltaic (PV) effect. Whereas you can ‘go solar’ at anytime by simply installing a solar PV system on your roof, and generate electricity from your own roof, there’s not that much you can change about most houses to adapt them to passive solar home design. The design is pretty much built-in. But when you are building a house, and can design from scratch, passive solar design is an important consideration. You can knock down the amount of energy you use quite considerably. Some states, (California) actually do require a very high level of efficiency with its Title24 building codes that have been in place over decades since 1977, and constantly tightened. 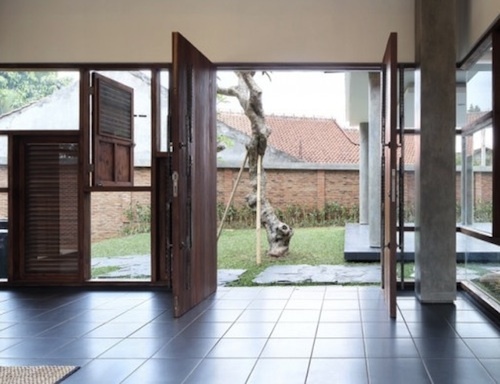 Title 24 tends to result in passive solar design, as well as other design innovations like triple-glazed windows and walls with very high R-values. These very strict building codes are part of why California’s energy use bottomed out since the 1970s. 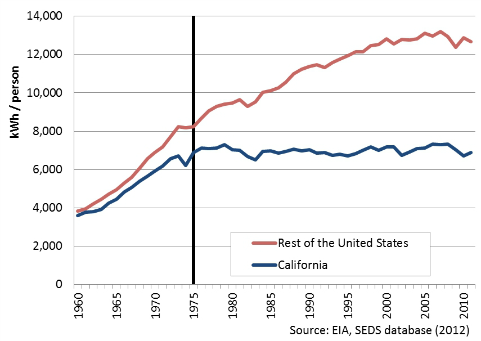 NRDC estimates it has saved Californians $30 billion over the years. 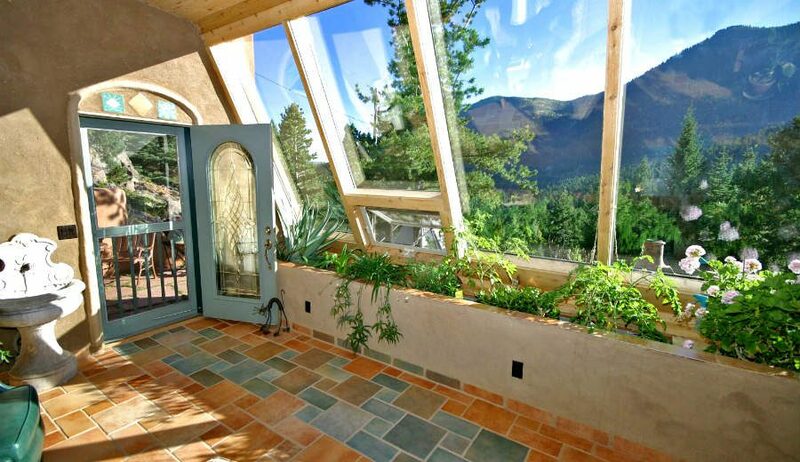 So what are the ways to improve a home’s use of free passive solar? The key elements of passive solar design are how you manage sun and shade, and where you position materials that store warmth. Think deep overhangs, big windows, strategic heat sinks. The old colonial houses of the South offer a great example of good passive solar design. Deep porches keep out the burning midday sun – preventing its heat from penetrating walls and glass windows in the summer, because the angle of the sun is higher in the sky. Then when winter rolls around, the sun is at a much lower angle in the sky, so, as long as there are big windows under the porch overhang, then the sun is able to reach far into the home to warm it up. But. That specific combination is key: deep porch AND big windows. A porch with small windows will result in a cold dark house. This can be a retrofit if your building codes allow for opening exterior walls to insert larger windows – think ceiling to floor. Then build a roofed porch outside these windows. The result would be a house with a wraparound porch on the three sunny sides (not the north) and large windows – with sliding doors or french doors opening onto the deck under the porch. The porch overhang needs to be designed to let most of the sun in the window in winter. A six to ten feet wide porch roof does it, depending on its height. There are additional ways to stop the sun hitting the glass or the walls in summer, but allowing it in winter. If you install full height sliding screens – on the outside of the house – the porch overhang doesn’t need to be as deep, because the sun is kept from heating the glass by the full length screen. 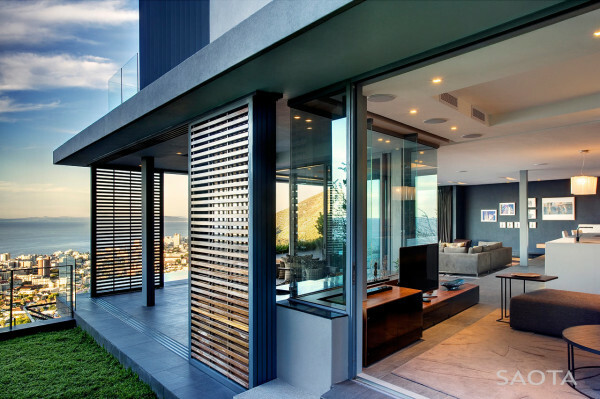 This is very popular in tropical beach houses and in modern tropical architecture like this design from the South African architecture studio SAOTA, showing just two of its twelve exterior sliding screens in use. 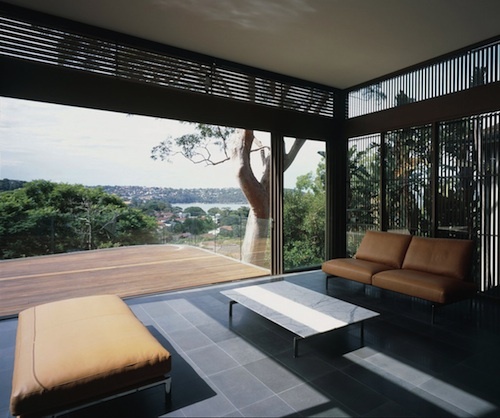 The second key aspect of passive solar design is to soak up the sun’s warmth in winter. Once you design so the sun is coming deep into the house, through the large south-facing windows, the floor becomes a heat sink—in the right materials. Thick slabs of dense materials like earth*, concrete, brick, ceramic tile or stone pavers over a concrete substrate are best at soaking up heat during the day and slowly releasing it at night. *Earth may not be a flooring material you’d consider, but even lots of large shallow planter pots placed to catch the sun near the big windows will have this heat sink effect too (to a lesser extent). 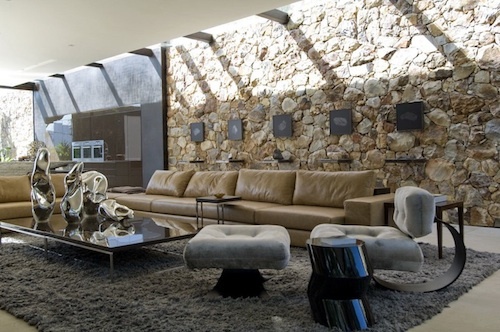 If you design a skylight to make the sun hit an interior wall, walls can be great heat sinks too, if in a thermal material like stone or concrete. Water is also a great heat sink – and here amplified by stone walls.